On a Monday night, I arrived home from work at 10pm and as I walked through the gym towards my room, I bumped into Kru Singh, who told me that I would be fighting that Thursday somewhere in Bangkok. Having had a fight cancelled the previous week on February 6th, this was music to my ears. It seems that February 6th was a particularly unlucky day for fight cancellations. It was ‘Muay Thai Day’, so lots of shows had been scheduled, but many of them fell through. Sylvie von Duuglas-Ittu was due to fight on the Muay Thai Angels show that day, only to have been cut at the last minute along with some other fighters due to budget problems. Juliana Rosa and Natasha Sky spoke of planning to fight in a tournament on that day along with Sawsing Sor. Sopit, which ended up getting cancelled. A few other fighters in my gym were also scheduled to fight in various places on that day, but those fights were cancelled as well. It started to feel like that date was cursed! Nevertheless, I was really glad that I didn’t have to go without a fight at all. It meant that I only had one full training session (before going to work the next day) to get in before the fight, but I’d been training to be fight-ready all the way up until this point, so it wasn’t a problem. Plus, I sometimes feel like short-notice fights are better because they give you no time to get worked up or nervous; you just have to get straight down to business. They’re a good way to test yourself. On the morning of the fight, I found out that it was taking place at Asiatique, which is an upscale, open-air mall across the river. Fighting in Bangkok meant that we didn’t have to leave the gym until 6pm, which made a really nice change and meant that I had the entire day free to rest, eat, read and do some mental training. 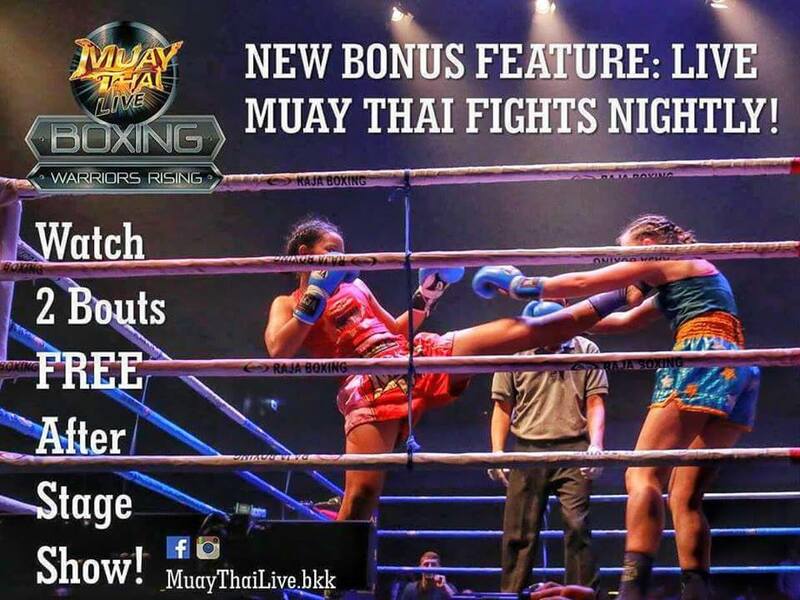 When we arrived, we were met by the promoter, who was sat on a plastic chair at a small table behind the theatre, where the Muay Thai Live: The Legend Lives stage show takes place (I wrote a review of this show last year, which you can read here). They’ve recently started to host fights at the same venue, with a Toyota Marathon and October’s Muay Thai Angels event taking place there. I chatted with the organisers for a while, who spoke really great English, one of them having studied in the US. When I asked how many fights were taking place that evening, I was surprised to hear that there were only two, me and my teammate, Louis. They explained that our fights would be a closing event for the stage show and that this was a feature that they’d started only the previous week, called ‘Muay Thai Live Boxing: Warriors Rising‘. This was a new experience for me, but meant that for once, the show would be organised and on-time. We arrived at 7pm, the stage show started at 8pm and finished at 9, after which we would go out and fight. With there being only two, there was no room for confusion or delay, and we’d be home nice and early! It sounded great to me. The only downside was that the fights were to be three-rounds long, which is not something I’m used to. I’d prefer to fight the traditional five rounds, but learning how to adapt to a three-rounder isn’t a bad thing, so I was up for it. Louis’ opponent turned up shortly after we did, but there was no sign of mine until just before we went in to get ready, when a group of girls turned up, all looking around my weight with their hair braided, a couple looking like they’d come straight from training or perhaps another fight. I figured that any one of them could have been my opponent, and I was OK with that. They were accompanied by Kru Pom, their trainer and the owner of Kiatpompetch Gym and a very familiar face. I’ve often seen him around. He works with the MBK Fight Night event and has a large amount of female fighters at his gym, one of them just having fought on the Muay Thai Angels show (Pinpetch Kiatpompetch vs. Aiyada Verpoest) He also runs the Muay Ying Association, which held an event at Sanam Luang on the Queen’s birthday last year alongside the Queen’s Cup Event by OneSongchai. I had watched a little of that show on the day before heading to Sylvie’s fight against Saya Ito. 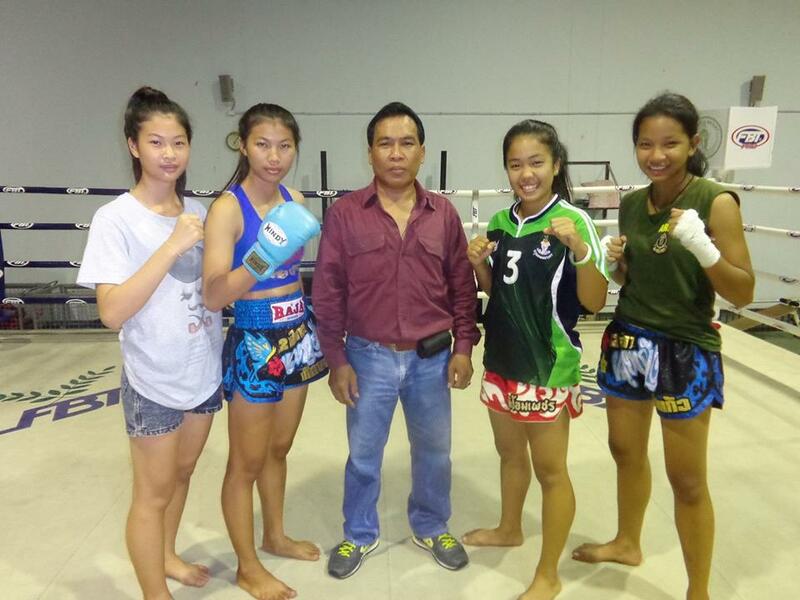 Kru Pom with some of his fighters. Petmuaklek on the right. It turned out none of the girls I’d seen on my way in was my opponent. Another girl, slightly taller than the others, walked in just at the last minute to join them and I was told that she was the one. I recognised her as one of the fighters from the Queen’s birthday Muay Ying Association show and although I didn’t remember much about her, I’d definitely seen her fight there. She seemed to get ready super-quickly and before I knew it, it was time to head towards the stage. I have no idea how they did it, but after the stage show finished, they put a ring together in less than ten minutes. Louis fought before me, which also happened really quickly as he stopped his opponent with a cut in the first round. It was time to go. My opponent went on stage before me, looking very confident and seemingly lapping up the attention as she shadowboxed around while the announcer called her name before heading towards the ring with a smile on her face. I’d previously been asked to do the same, but I’m really uncomfortable and awkward with that kind of thing, so just threw a few punches, looked at the floor and made my way to the ring. When I got there, two stagehands held the ropes open at the middle for me to go through, rather than lifting the bottom one for me to crawl under. I’m not sure why that was, but I went with it. I recognised the referee as Mr. Pornkaew, who often referees at MBK Fight Night, where my opponent’s trainer also works. I suspected that this meant I would have to get a knock out to win, but that was OK. When he brought us both to the centre of the ring, my opponent gave me a very patronising pat on the back with a smile that seemed to be an attempt at intimidation. She was definitely confident, but so was I. During the first round, I felt a little iffy. My feet weren’t moving the way that I wanted them to and as a result, I was having trouble pulling the trigger. Because of my hesitation, she kept catching me with teeps to the chest and body. a couple of times, I lost my balance a bit, so I knew my footwork was really not where it was supposed to be. It was only during the round that I realised that we were fighting three-minute rounds instead of the usual two, and by the end of the first, I’d started pulling myself together, cutting off the ring, blocking kicks and using my hands more. By the end of that round, I had her in the clinch, but could only throw one knee before the bell rang. Although neither us were throwing with any power in that round and were just feeling each other out, I let a lot of shots in that I really didn’t need to, so went back to the corner wondering what I was doing. When I got there, Jesse told me that every time I’d doubled up on combinations, they’d landed, so I was to keep doing that. Although I hadn’t fought the way I wanted to in that first round, I knew there was no reason for me to lose that fight. In the second round, I started to go forward more. Early on, we got into the clinch and after I threw a knee, my right leg ended up on the outside of the rope, leaving me stuck. I ate a couple of good knees before the referee broke it up, unsure if it was because he didn’t see it or that he was just taking his time, but threw my hands up at him to complain about it anyway. Shortly after that, we had a good exchange of kicks and as she came in, I landed a couple of punches and an elbow, but instinctively moved backwards afterwards, right in the moment that Master Toddy would call ‘the goal time’. It’s a habit that I really need to get out of. I knew then that following up was all I needed to do, so started committing more to roundhouse kicks and punches. At first, she was countering with step-in knees, but I could see that the body kicks had hurt her. I threw one on its own and she crumpled a bit, so I pushed further forward with punches. She kept trying to walk in with those knees, but as she did so, I stepped in with a jab and it dropped her. She sat up, crossed her legs, spat her mouthguard out and started heaving while the referee gave her an eight count before picking up her mouthguard and walking her back to her corner to put it back in. She waited there for a moment, leaning over the ropes and ‘stretching’ to stall a little before we were back on again. I could hear Jesse in my corner shouting ‘don’t let her breathe!‘ and knew not to waste any time, so I came in with some more punches, leading her back to the same corner in which I’d just dropped her. There, I landed another right body kick and as my foot came down, I threw my right hand at her. It connected and she went down immediately. That was it, a second round KO. I was pretty happy with that. A year ago today, I fought Petmuaklek on @muaythailive.bkk and won by KO in the second round after putting her down for an 8 count (which ended up being more like a 15 count) with a left hand and then coming straight back into the same corner and putting her down again with the right. It wasn't my prettiest fight, but I got the job done. Next fight on March 1st. 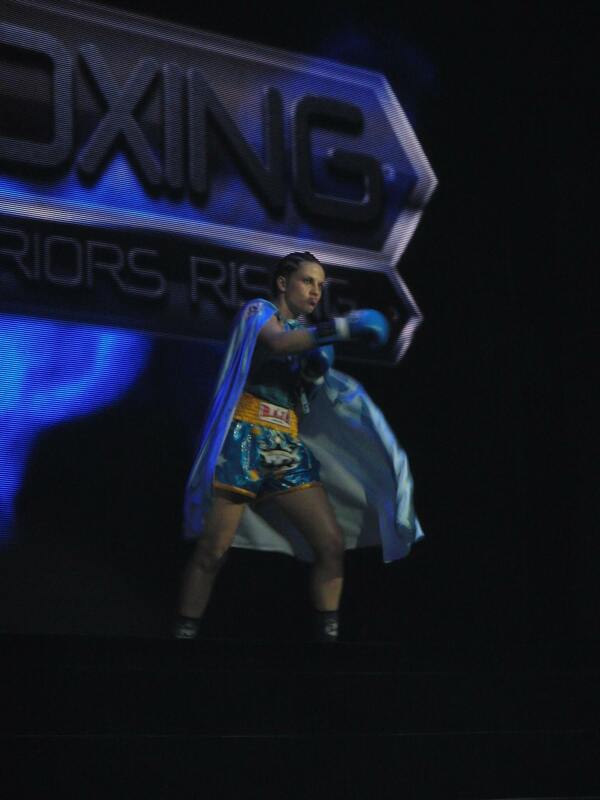 As we were walking backstage after the fight, her trainer, Kru Pom, came out to collect my gloves and shorts. It appears that he is some kind of organiser for the show, perhaps the matchmaker or something. So, he not only provides fighters but somewhat runs the show. That, coupled with the fact that the referee is his buddy, probably meant that the odds would not have been in my favour had it gone to a decision. Kru Pom seemed a little off when I spoke to him, although it was understandable, seeing as I’d just KO’d his girl. He made a generic excuse about her not having time to train and promised that if she trained more, I would definitely lose next time. I’m always happy at the prospect of a rematch, just because it means another opportunity to fight. If it comes along, I’ll gladly accept. It wasn’t until after the fight that I was able to get the name of my opponent. It was Petmuaklek Kiatpompetch (เพชรมวกเหล็ก เกียรติป้อมเพชร), ‘Petmuaklek’ meaning ‘The Diamond of Muak Lek’. 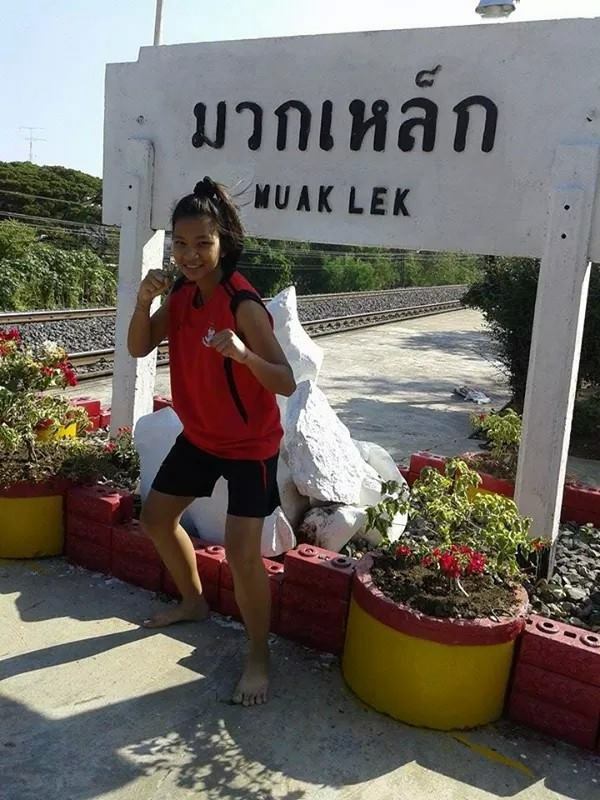 Muak Lek is a district in the Saraburi province, which I assume is her hometown. Below, you can see a picture of her posing next to a sign there. 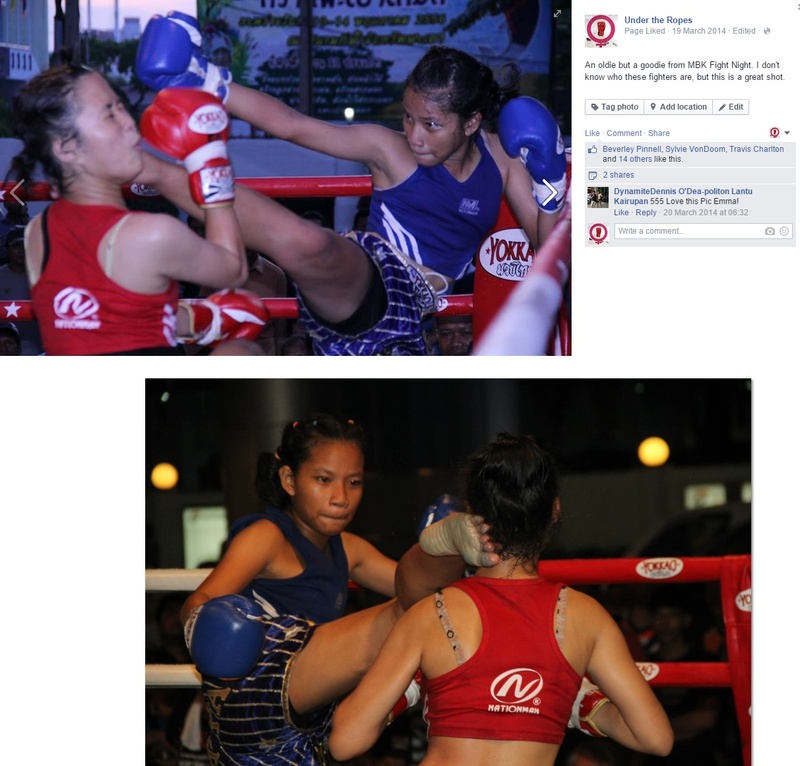 Once I had her name, I managed to find an old profile of her on MeeBoard, which is an awesome resource for Thai female fighters that Sylvie von Duuglas-Ittu brought to my attention not long ago. If you type the Thai script of almost any female fighter’s name into Google, it will almost certainly take you to that site. There, you can find details of fighters’ weights, records etc. I’m unsure as to how reliable that information is, but it’s really great that it’s out there. Below is her profile from last year, which states that at the time, she was 16 years old and 48kg with a record very similar to what mine is now. This fight was at 52kgs. Petmuaklek has also fought under another name, KejKeaw Chalerm PraKiat, which is the one she used on the Queen’s Birthday. She’s also fought on the MBK show multiple times last couple of years, which also contributed to me recognising her. Funnily enough, I unknowingly posted a picture of her on my Facebook page last year, sharing it from the MBK Fight Night page because I liked the shot. The second one is another shot of her throwing another one of those headkicks in a separate MBK fight. Thankfully, I didn’t see any of those when she fought me. You can see how much she’s grown since those fights, even though they were only up to two years ago. She was probably only around 15 in these fights. 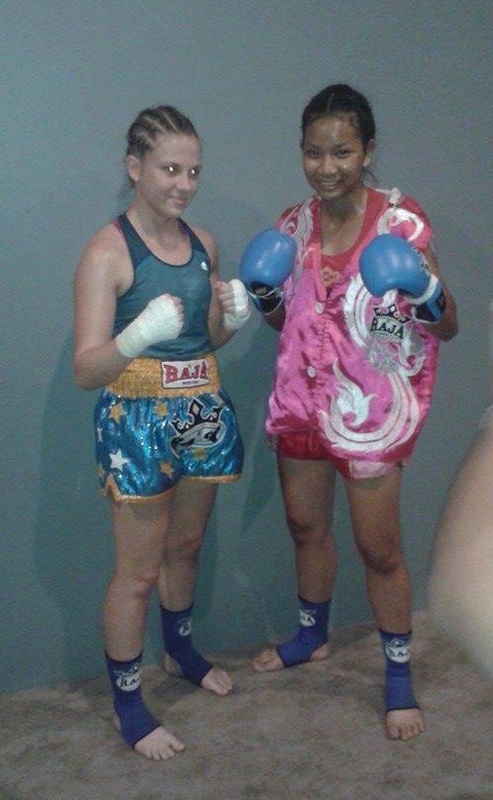 This is one of the things about being a female fighter in Thailand, you’re often fighting teenagers, simply because female fighters are most active around that age and have usually retired by the time they’ve reached their early twenties, an age at which many foreigners come out here to fight. It’s often the case here that you’ll fight a girl in her teens and then come across her again a year or so down the line to see that she’s grown substantially and totally outweighs you. Sylvie wrote about these kind of matchups here and here. 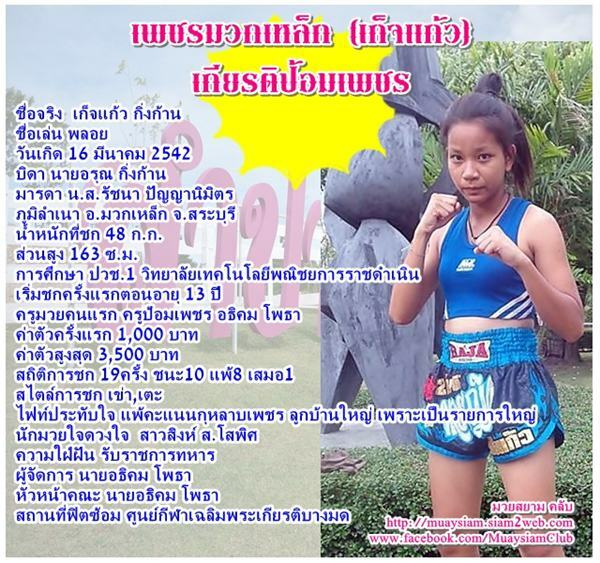 Update: I found that Pet Muaklek fought the same girl I’d fought in my last fight before this one, Hongyok Lek Liangprasert on 19th November 2014, losing on points. See the video here. I hadn’t exactly fought the way I wanted to in this fight, but that is almost always the case. As fighters, we’re constantly trying to be able to take what we know from training into the ring, and it takes a lot of time an experience to be able to really do that. Still, I KO result can’t be a bad thing, so overall, I was really happy. Kru Singh also appeared to be, and when I came to training the next morning, he exclaimed ‘new year, new Emma, new winner!‘ (as I’d lost my previous fight, which took place just before the end of the year). It was pretty funny, but also endearing to see how happy he was that I’d done well. He does a lot of work with me, so it must have been nice for him to see it come together. It’s the same feeling I get with my students, like earlier this week when one of them ran up to me and told me that she’d passed her entry exam for her Master’s degree, which I’d been helping her to prepare for. Moments like that are why I love teaching. I’ve said it before, but I count myself very lucky that I’m able to have a lifestyle here that consists of all the things that I love; training, teaching and fighting. It’s wonderful. Kru Pom asked me to come back and fight again the following week, which was a massive bonus. Being able to fight frequently, for me, is the key to being able to fight well, so I’m excited at that prospect. It’s also extremely convenient, since the venue isn’t too far from the gym and is a relatively short show, which means that I can fight and go straight home without a long journey, getting out of the by 10pm! I can definitely do more of that. Below, along with a gallery of pictures from the fight, is a photo from the show’s Facebook page, taken from the fight and being used to promote the fights there.